Small lymphatic nodules can normally be observed on the posterior wall. With infection in the nose or sinuses, mucus or pus may be visible trickling down the back of the throat. Koplik's spots. In measles small white spots on an erythematous background arc distributed over the mucosa of the cheeks opposite the molar teeth and sometimes throughout the mouth. These Koplik's spots are of diagnostic value as they appear before the rash. Aphthous stomatitis. This is characterised by ulcers on the inner sides of the lips, the edges of the tongue, the insides of the cheek or on the palate. 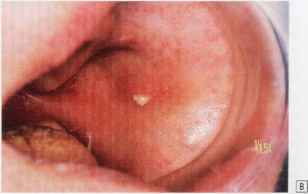 Initially small vesicles form, which quickly burst, leaving shallow ulcers usually surrounded by a red margin. Such ulcers can cause intense discomfort. They may heal quickly in a day or two. or they may progress into deep indurated ulcers which heal slowly (Fig. 2.37} and may leave a small scar. The lesions tend to occur in crops; a patient may be free from ulcers tor months only to relapse. The cause is obscure. 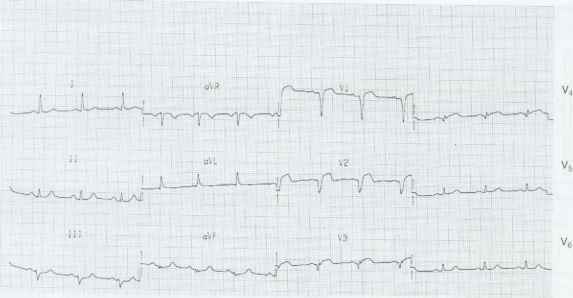 They arc often seen in patients with ulcerative colitis. Fig. 2.37 Aphthous stomatitis causing a deep ulcer in a young patient with inflammatory bowel disease. Pigmentation in the mouth. Melanin deposition in the buccal mucosa is normal in black people and is proportionally reduced as the skin becomes lighter. 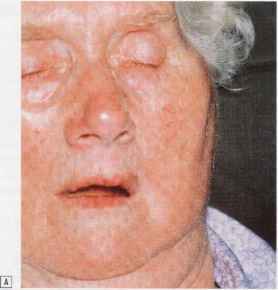 Pathological pigmentation in the mouth occurs in Addison's disease (Fig. 2.38). Other causes are chronic cachexia, the malabsorption syndrome, haemochromatosis or the rare Peutz-Jeghers syndrome. This comprises polyposis of the small intestine with pigmentation around and in the mouth and on the lips and lingers. In patients with black hair and brown eyes buccal pigmentation may be congenital. While examining the mouth, the opening of the parotid duct may be seen on the buccal mucosa as a small papilla opposite the second upper molar tooth. The openings of the submandibular salivary gland ducts seldom require identification, but may be found near the midline in She sublingual papilla, adjoining the root of the frenulum of the tongue. Each of these openings is more readily seen if a free flow of saliva is provoked by something tasty. Purulent Infections of the salivary glands may be investigated by culturing pus expressed through these orifices. Fig, 2,39 [3 Suppurative parotitis with [¥] pus discharging from parotid duct. • Patients who are compromised for any reason are at increased risk, especially from infection. • It is important to recognise, and treat, conditions which are treatable. 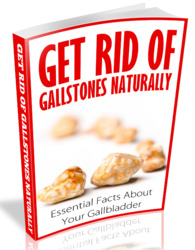 • The successful management of a 'minor problem' may produce major symptomatic relief. intermittent swelling with pain while eating. Obstruction due to salivary calculi is very much more frequent in the submandibular ducts. The submandibular glands may sometimes be affected by mumps in the absence of parotid swelling. 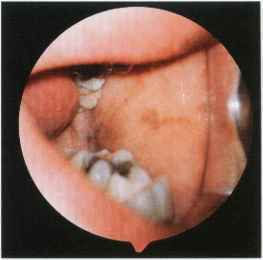 Why koplick duct ocuurs at 2nd molar?